Marinate the chicken in 1/2 cup of Spinelli’s Gorgonzola dressing. Grill until chicken is thoroughly cooked. Snap the ends from the asparagus and discard. Place the asparagus in a bowl and add the red onion slivers. Toss the asparagus and the red onion with olive oil, salt and pepper – grill until just done but still have a little crunch. Cut cooked chicken breasts into slices. Place a bed of the mixed greens serving plates. 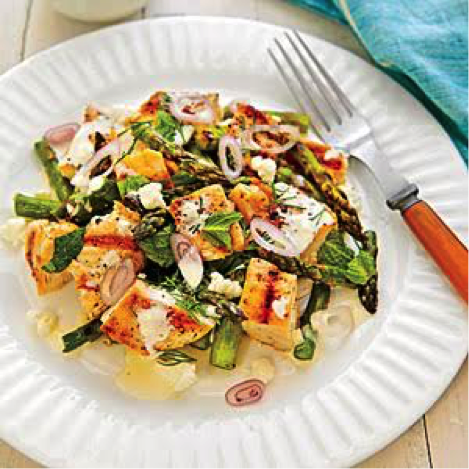 Distribute the grilled chicken breast slices, grilled asparagus, grilled onion and sun dried tomatoes over the bed of greens and drizzle Spinelli’s Gorgonzola dressing generously. Garnish with gorgonzola crumbles. Enjoy!